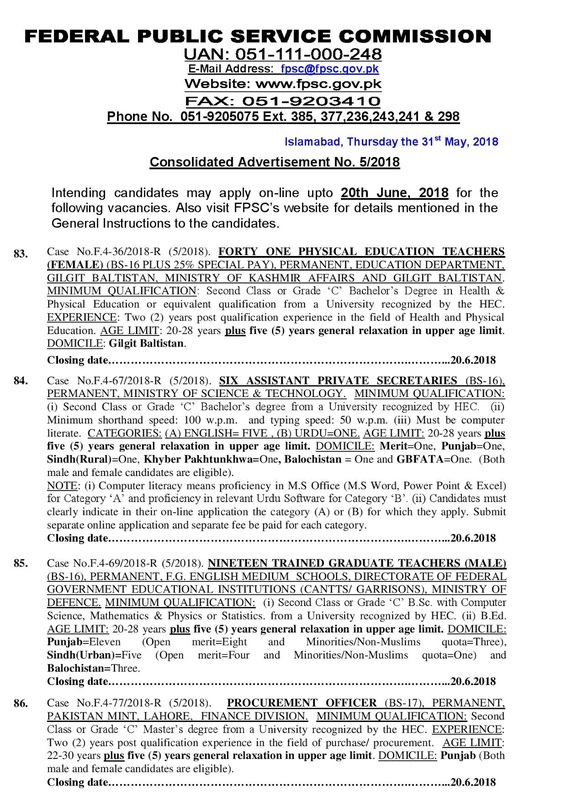 Federal Public Service Commission announced more then 500 position for all over Pakistan including Gilgit-Baltistan. 9. 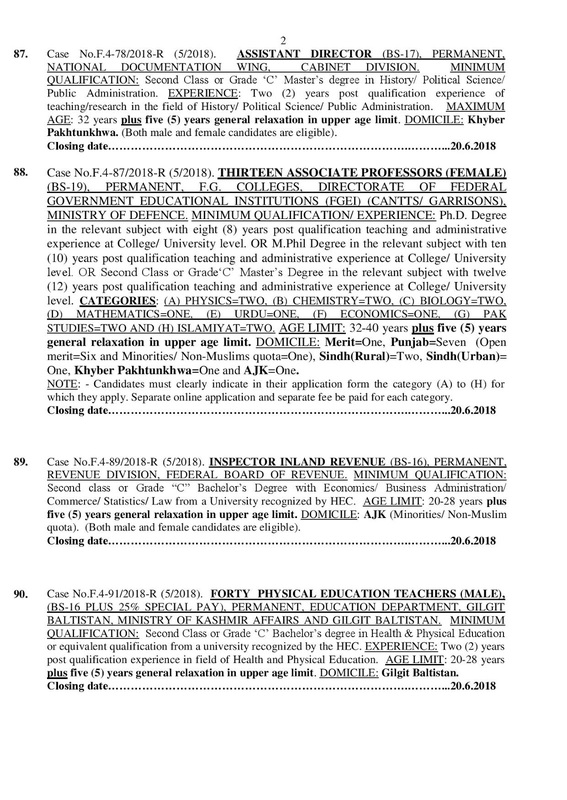 FORTY ONE ASSISTANT PRIVATE SECRETARIES (BS-16), PERMANENT, SPECIAL COURTS/ TRIBUNALS, MINISTRY OF LAW & JUSTICE. 11. 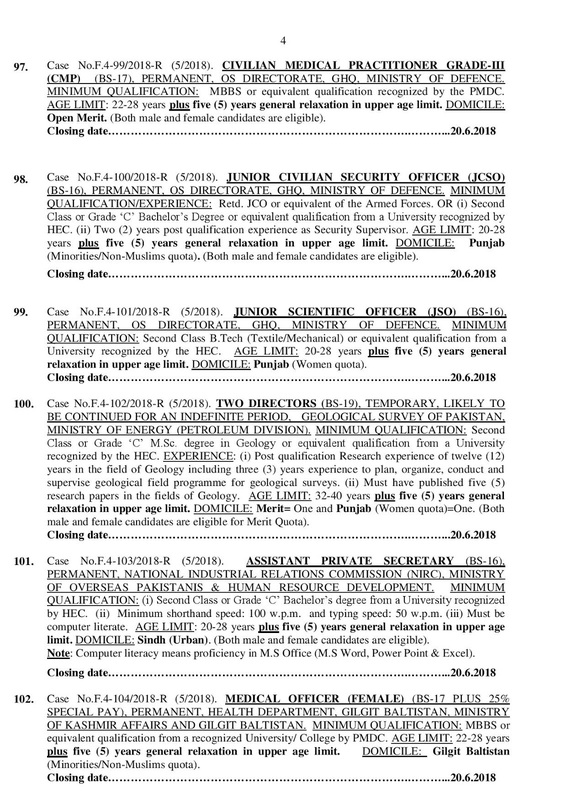 ASSISTANT PROGRAMMER (BS-17), PERMANENT, MILITARY ENGINEER SERVICES, MINISTRY OF DEFENCE (DEFENCE DIVISION). 19. 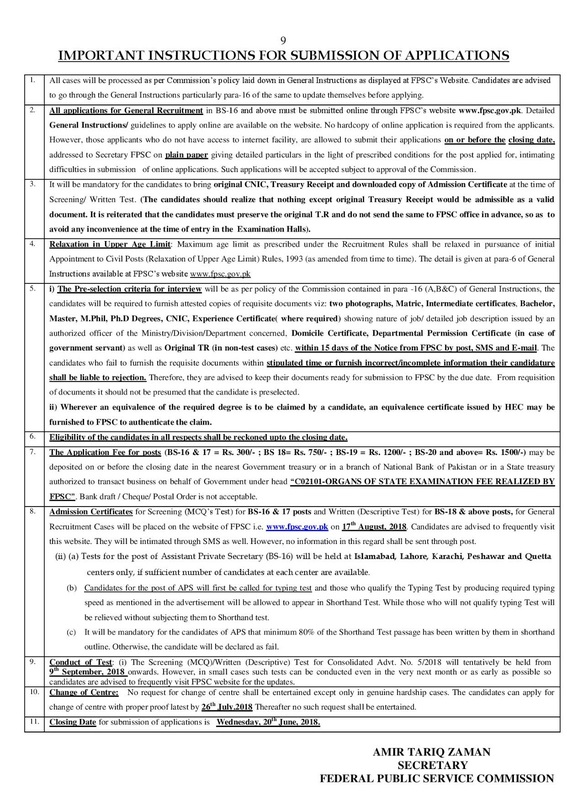 ASSISTANT PRIVATE SECRETARY (BS-16), PERMANENT, NATIONAL INDUSTRIAL RELATIONS COMMISSION (NIRC), MINISTRY OF OVERSEAS PAKISTANIS & HUMAN RESOURCE DEVELOPMENT. 23. 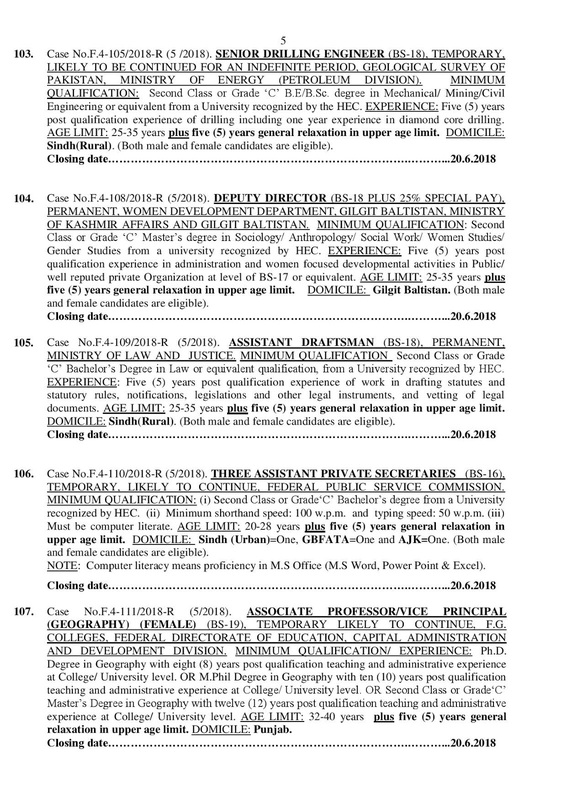 ASSISTANT DRAFTSMAN (BS-18), PERMANENT, MINISTRY OF LAW AND JUSTICE. 24. 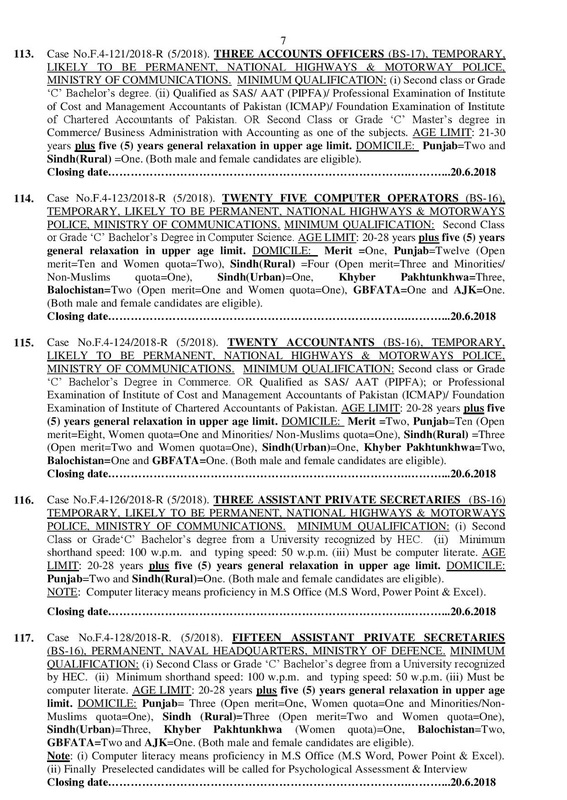 THREE ASSISTANT PRIVATE SECRETARIES (BS-16), TEMPORARY, LIKELY TO CONTINUE, FEDERAL PUBLIC SERVICE COMMISSION. 26. 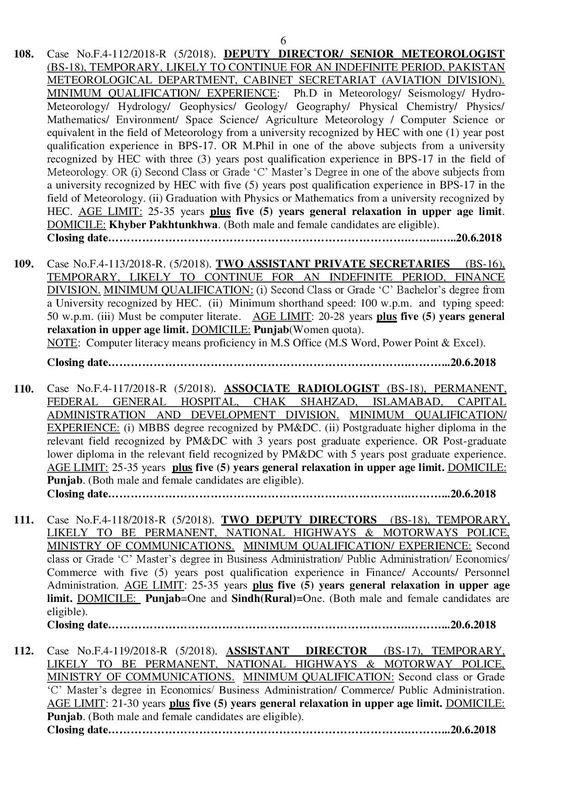 DEPUTY DIRECTOR/ SENIOR METEOROLOGIST (BS-18), TEMPORARY, LIKELY TO CONTINUE FOR AN INDEFINITE PERIOD, PAKISTAN METEOROLOGICAL DEPARTMENT, CABINET SECRETARIAT (AVIATION DIVISION). 28. ASSOCIATE RADIOLOGIST (BS-18), PERMANENT, FEDERAL GENERAL HOSPITAL, CHAK SHAHZAD, ISLAMABAD, CAPITAL ADMINISTRATION AND DEVELOPMENT DIVISION. 39. 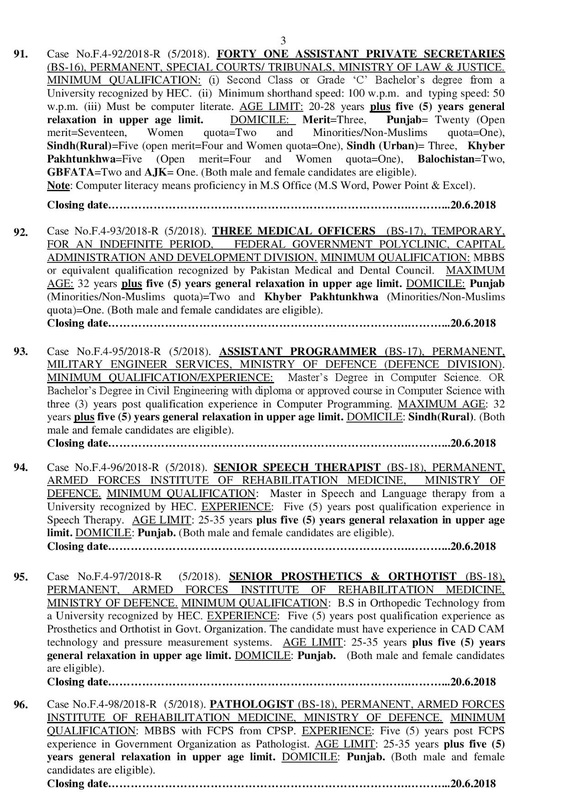 THREE DIETITIAN (BS-17), PERMANENT, PAKISTAN AIR FORCE, (DEFENCE DIVISION), MINISTRY OF DEFENCE. 40. 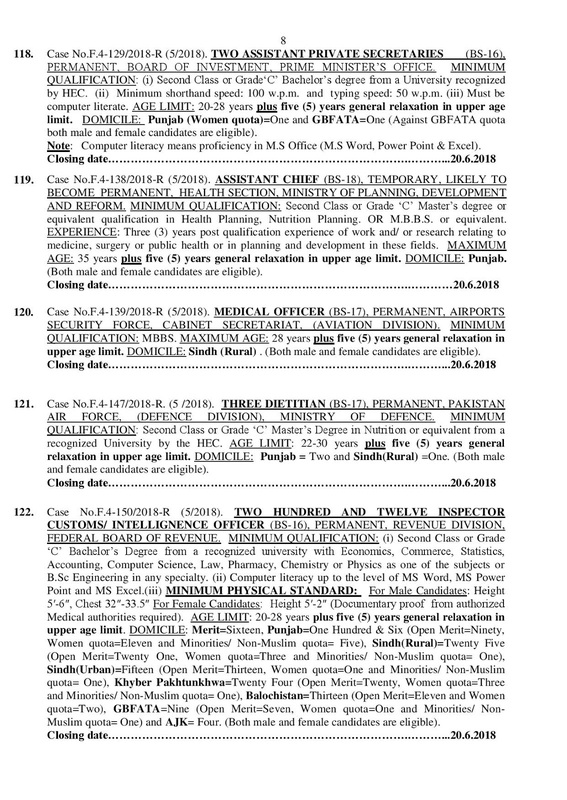 TWO HUNDRED AND TWELVE INSPECTOR CUSTOMS/ INTELLIGNENCE OFFICER (BS-16), PERMANENT, REVENUE DIVISION, FEDERAL BOARD OF REVENUE.